USB Type A connectors, officially called Standard-A connectors, are flat and rectangular in shape. Type A is the "original" USB connector and is the most recognizable and commonly used connector. USB Type-A connectors are supported in every USB version, including USB 3.0, USB 2.0, and USB 1.1. 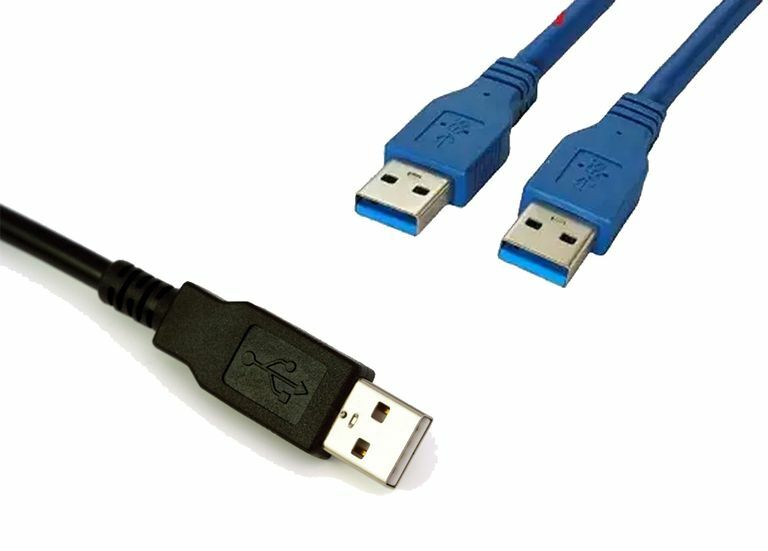 USB 3.0 Type A connectors are often, but not always, the color blue. USB 2.0 Type A and USB 1.1 Type A connectors are often, but not always, black. The male USB Type A connector is called the plug and the female connector is called the receptacle but is commonly referred to as the port. USB Type A ports/receptacles are found on almost any modern computer-like device that can act as a USB host, including, of course, computers of all kinds including desktops, laptops, netbooks, and most tablets. USB Type A ports are also found on other computer-like devices like video game consoles (PlayStation, Xbox, Wii, etc. ), home audio/video receivers, "smart" televisions, DVRs, streaming players (Roku, etc. ), DVD and Blu-ray players, and more. Most USB Type A plugs are found at one end of many different kinds of USB cables, each designed to connect the host device to some other device that also supports USB, usually via a different USB connector type like Micro-B or Type B.
USB Type A plugs are also found at the end of cables that are hard-wired into a USB device. This is typically how USB keyboards, mice, joysticks, and similar devices are designed. Some USB devices are so small that the cable isn't necessary. In those cases, a USB Type A plug is integrated directly into the USB device. The common flash drive is a perfect example. The USB Type A connectors outlined in all three USB versions share basically the same form factor. This means that the USB Type A plug from any USB version will fit into the USB Type A receptacle from any other USB version and vice versa. That said, there are some significant differences between USB 3.0 Type A connectors and those from USB 2.0 and USB 1.1. USB 3.0 Type A connectors have nine pins, considerably more than the four pins that make up USB 2.0 and USB 1.1 Type A connectors. These additional pins are used to enable the faster data transfer rate found in USB 3.0 but they are placed in the connectors in a way that does not prevent them from physically working with Type A connectors from the previous USB standards. See my USB Physical Compatibility Chart for a graphical representation of physical compatibility between USB connectors. Just because the Type A connector from one USB version fits in the Type A connector from another USB version does not mean that the connected devices will work at the highest speed, or even at all.